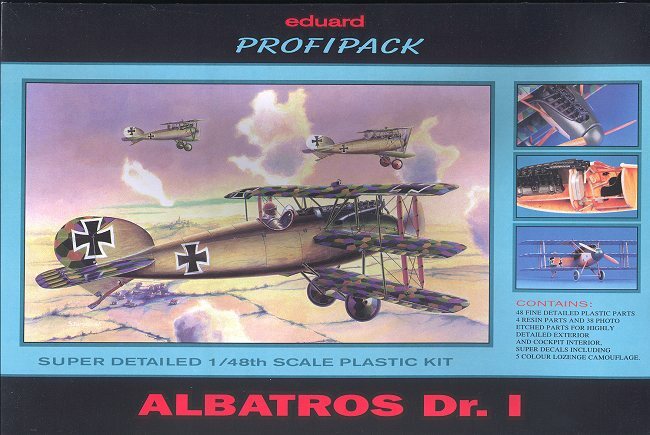 The Albatros Dr.I is one of those planes that should have beengood but wasn't. During the First World War, aviation was in its infancy and anumber of interesting designs were flown, but never accepted for service. TheAlbatros Dr.I was one of those. Built to try to improve climb performance, itused the fuselage and engine of the Albatros D.V and D.Va currently inservice. It featured rather narrow wings, all of the same span, but wasotherwise the same as current D.Vs. It was turned over to the German Air Forcefor testing in September of 1917. The test pilots were generally unimpressedwith the aircraft and complained of it being tail-heavy. Needless to say, thismeant no full scale production. The number of prototypes built is unclear, butmost think that just this one was built. Over the years, Eduard has really improved on its kits. While WWI is not myforte, this kit looks to be especially nice. The detailing is very crisp, thesprue gates are small and the parts are free from flash. There are few ejectorpin stub or marks and what are there are easily removed and in places that won'tbe seen when the kit is finished. I found no sink marks, either. 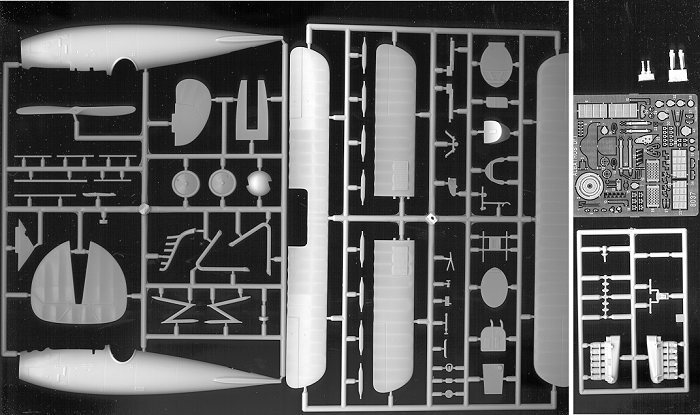 The photo etch sheet contains bits and pieces for all over the aircraft, fromcockpit handles, instrument panel and seat to gun jackets to fuselage inspectionpanels and bell cranks There are also four small resin pieces. These are limitedto the main body and the forward barrel of the two machine guns. The instructions are quite good as one would expect from a 1998 issue kit. Itis very similar to Hasegawa instruction sheets in that it is in greys and blues.There are the usual pages of color charts, parts charts, and an 8 stepconstruction sequence. Several of the steps have a number of substeps in themshowing exact location and position of the various photo etched bits, so thereshould be no confusion as to placement of these parts. A complete rigging andpainting/decal guide is also given. The decal sheet isfor one aircraft , but it includes all the upper and lower lozenge as well asthe rib tapes for it. Apparently one just folds over the rib tapes. This is anice touch as it cuts the application time in half!! There is also a sheet ofcrosses and instrument decals for the instrument panel. The rest of the fuselageis stained plywood. Several aftermarket decal companies make sheets that aresuitable, or you can use paint to duplicate the effect. Overall, it looks like another winning WWI kit from Eduard.